Why do people start a business? Why do they want to become an entrepreneur? 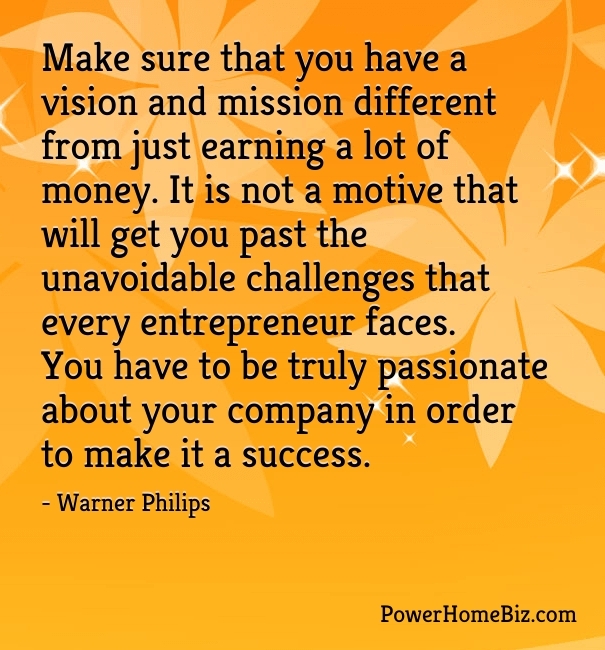 Each business owner has his or her own reasons for starting a business. There are those who have unequivocal beliefs that their products or services are just what the world needs. Others start a business because of their firm resolve that their business can provide help to their target market. Others start a business because of their need to achieve personal gain, to help their families, and still others feel that entrepreneurship is their best path to achieve their goals in life. The study identified several motivations that compel a person to become an entrepreneur, such as need for achievement and risk taking. Entrepreneurs also possess “tolerance for ambiguity” — even though there is no assurance that a business will succeed, entrepreneurs are not daunted by this uncertainly and instead continue to pursue the idea of starting a business. They also possess “locus of control” – they want their actions to have a direct impact on results. These are individuals who want to be in direct control. Empirical studies are great, but I prefer listening to stories of entrepreneurs and what made them decide to become an entrepreneur. In our recently concluded Lenovo giveaway contest, we asked entrants their motivations for starting a business. Sometimes becoming an entrepreneur is the fulfillment of a lifelong dream, mostly influenced by family. Even studies show the strong parental influence in instilling the desire to be entrepreneurs: there is a higher likelihood for a person to become an entrepreneur if their parents are also entrepreneurs. Seven years ago, at the age of 17, I came to America with my mother with nothing more than couple hundred dollars and a small suitcase of old clothes. And now after seven years of hard work, I am about to fulfill my childhood dream of opening my very own Chinese restaurant (Cooking has always been my utmost passion). Getting to where I am right now wasn’t easy. It took a heavy dose combination of motivation, determination, commitment, and perseverance. I had to work two jobs at a time while learning a second language and various other types of cooking styles: all in preparations of opening my own restaurant. More importantly, I am also doing this for my late father, who passed away before realizing his dream of owning a restaurant. As his daughter, I shall finish the path for him.